Explain the relationship between vapor pressure of water and the capacity of air to hold water vapor. Explain the relationship between relative humidity and partial pressure of water vapor in the air. Calculate vapor density using vapor pressure. Calculate humidity and dew point. The expression “it’s not the heat, it’s the humidity” makes a valid point. We keep cool in hot weather by evaporating sweat from our skin and water from our breathing passages. Because evaporation is inhibited by high humidity, we feel hotter at a given temperature when the humidity is high. Low humidity, on the other hand, can cause discomfort from excessive drying of mucous membranes and can lead to an increased risk of respiratory infections. When we say humidity, we really mean relative humidity. Relative humidity tells us how much water vapor is in the air compared with the maximum possible. At its maximum, denoted as saturation, the relative humidity is 100%, and evaporation is inhibited. The amount of water vapor in the air depends on temperature. For example, relative humidity rises in the evening, as air temperature declines, sometimes reaching the dew point. At the dew point temperature, relative humidity is 100%, and fog may result from the condensation of water droplets if they are small enough to stay in suspension. Conversely, if you wish to dry something (perhaps your hair), it is more effective to blow hot air over it rather than cold air, because, among other things, the increase in temperature increases the energy of the molecules, so the rate of evaporation increases. The amount of water vapor in the air depends on the vapor pressure of water. 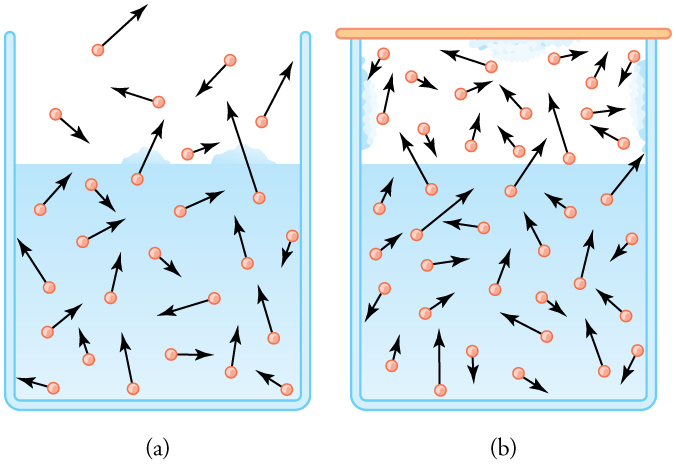 The liquid and solid phases are continuously giving off vapor because some of the molecules have high enough speeds to enter the gas phase; see Figure 2(a). 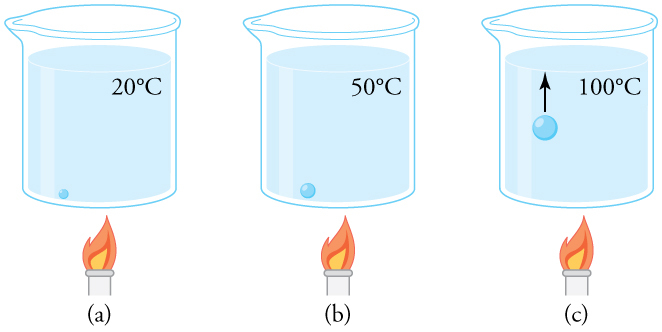 If a lid is placed over the container, as in Figure 2(b), evaporation continues, increasing the pressure, until sufficient vapor has built up for condensation to balance evaporation. Then equilibrium has been achieved, and the vapor pressure is equal to the partial pressure of water in the container. Vapor pressure increases with temperature because molecular speeds are higher as temperature increases. Table 5 gives representative values of water vapor pressure over a range of temperatures. Figure 2. (a) Because of the distribution of speeds and kinetic energies, some water molecules can break away to the vapor phase even at temperatures below the ordinary boiling point. (b) If the container is sealed, evaporation will continue until there is enough vapor density for the condensation rate to equal the evaporation rate. This vapor density and the partial pressure it creates are the saturation values. They increase with temperature and are independent of the presence of other gases, such as air. They depend only on the vapor pressure of water. Relative humidity is related to the partial pressure of water vapor in the air. At 100% humidity, the partial pressure is equal to the vapor pressure, and no more water can enter the vapor phase. If the partial pressure is less than the vapor pressure, then evaporation will take place, as humidity is less than 100%. If the partial pressure is greater than the vapor pressure, condensation takes place. In everyday language, people sometimes refer to the capacity of air to “hold” water vapor, but this is not actually what happens. The water vapor is not held by the air. The amount of water in air is determined by the vapor pressure of water and has nothing to do with the properties of air. Table 5 gives the vapor pressure of water at as Use the ideal gas law to calculate the density of water vapor in that would create a partial pressure equal to this vapor pressure. Compare the result with the saturation vapor density given in the table. where is the number of moles. If we solve this equation for to calculate the number of moles per cubic meter, we can then convert this quantity to grams per cubic meter as requested. To do this, we need to use the molecular mass of water, which is given in the periodic table. 4. Convert the density in moles per cubic meter to grams per cubic meter. The density is obtained by assuming a pressure equal to the vapor pressure of water at The density found is identical to the value in Table 5, which means that a vapor density of at creates a partial pressure of equal to the vapor pressure of water at that temperature. If the partial pressure is equal to the vapor pressure, then the liquid and vapor phases are in equilibrium, and the relative humidity is 100%. Thus, there can be no more than 17.2 g of water vapor per at so that this value is the saturation vapor density at that temperature. This example illustrates how water vapor behaves like an ideal gas: the pressure and density are consistent with the ideal gas law (assuming the density in the table is correct). The saturation vapor densities listed in Table 5 are the maximum amounts of water vapor that air can hold at various temperatures. We can use this and the data in Table 5 to do a variety of interesting calculations, keeping in mind that relative humidity is based on the comparison of the partial pressure of water vapor in air and ice. (a) Percent relative humidity is defined as the ratio of vapor density to saturation vapor density. (b) The air contains of water vapor. The relative humidity will be 100% at a temperature where is the saturation density. Inspection of Table 5 reveals this to be the case at where the relative humidity will be 100%. That temperature is called the dew point for air with this concentration of water vapor. The importance of dew point is that air temperature cannot drop below in part (b), or in part (c), without water vapor condensing out of the air. If condensation occurs, considerable transfer of heat occurs (discussed in Chapter 14 Heat and Heat Transfer Methods), which prevents the temperature from further dropping. When dew points are below freezing temperatures are a greater possibility, which explains why farmers keep track of the dew point. Low humidity in deserts means low dew-point temperatures. Thus condensation is unlikely. If the temperature drops, vapor does not condense in liquid drops. Because no heat is released into the air, the air temperature drops more rapidly compared to air with higher humidity. Likewise, at high temperatures, liquid droplets do not evaporate, so that no heat is removed from the gas to the liquid phase. This explains the large range of temperature in arid regions. Figure 3. 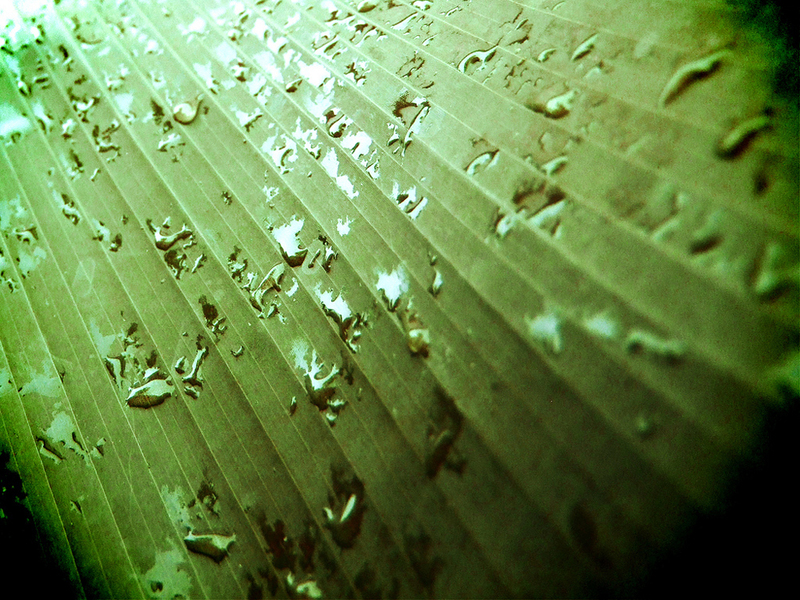 (a) An air bubble in water starts out saturated with water vapor at 20ºC. (b) As the temperature rises, water vapor enters the bubble because its vapor pressure increases. The bubble expands to keep its pressure at 1.00 atm. (c) At 100ºC, water vapor enters the bubble continuously because water’s vapor pressure exceeds its partial pressure in the bubble, which must be less than 1.00 atm. The bubble grows and rises to the surface. 1: Freeze drying is a process in which substances, such as foods, are dried by placing them in a vacuum chamber and lowering the atmospheric pressure around them. How does the lowered atmospheric pressure speed the drying process, and why does it cause the temperature of the food to drop? Relative humidity is the fraction of water vapor in a gas compared to the saturation value. The saturation vapor density can be determined from the vapor pressure for a given temperature. The dew point is the temperature at which air reaches 100% relative humidity. 1: Because humidity depends only on water’s vapor pressure and temperature, are the saturation vapor densities listed in Table 5 valid in an atmosphere of helium at a pressure of rather than air? Are those values affected by altitude on Earth? 2: Why does a beaker of water placed in a vacuum chamber start to boil as the chamber is evacuated (air is pumped out of the chamber)? At what pressure does the boiling begin? Would food cook any faster in such a beaker? 3: Why does rubbing alcohol evaporate much more rapidly than water at STP (standard temperature and pressure)? 3: Pressure cookers increase cooking speed by raising the boiling temperature of water above its value at atmospheric pressure. (a) What pressure is necessary to raise the boiling point to (b) What gauge pressure does this correspond to? 6: At a spot in the high Andes, water boils at greatly reducing the cooking speed of potatoes, for example. What is atmospheric pressure at this location? 7: What is the relative humidity on a day when the air contains of water vapor? 8: What is the density of water vapor in on a hot dry day in the desert when the temperature is and the relative humidity is 6.00%? 9: A deep-sea diver should breathe a gas mixture that has the same oxygen partial pressure as at sea level, where dry air contains 20.9% oxygen and has a total pressure of (a) What is the partial pressure of oxygen at sea level? (b) If the diver breathes a gas mixture at a pressure of what percent oxygen should it be to have the same oxygen partial pressure as at sea level? 12: If the relative humidity is 90.0% on a muggy summer morning when the temperature is what will it be later in the day when the temperature is assuming the water vapor density remains constant? 13: Late on an autumn day, the relative humidity is 45.0% and the temperature is What will the relative humidity be that evening when the temperature has dropped to assuming constant water vapor density? 14: Atmospheric pressure atop Mt. Everest is (a) What is the partial pressure of oxygen there if it is 20.9% of the air? (b) What percent oxygen should a mountain climber breathe so that its partial pressure is the same as at sea level, where atmospheric pressure is (c) One of the most severe problems for those climbing very high mountains is the extreme drying of breathing passages. Why does this drying occur? 16: On a certain day, the temperature is and the relative humidity is 90.0%. How many grams of water must condense out of each cubic meter of air if the temperature falls to Such a drop in temperature can, thus, produce heavy dew or fog. The boiling point of water increases with depth because pressure increases with depth. At what depth will fresh water have a boiling point of if the surface of the water is at sea level? (a) At what depth in fresh water is the critical pressure of water reached, given that the surface is at sea level? (b) At what temperature will this water boil? (c) Is a significantly higher temperature needed to boil water at a greater depth? To get an idea of the small effect that temperature has on Archimedes’ principle, calculate the fraction of a copper block’s weight that is supported by the buoyant force in water and compare this fraction with the fraction supported in water. If you want to cook in water at you need a pressure cooker that can withstand the necessary pressure. (a) What pressure is required for the boiling point of water to be this high? (b) If the lid of the pressure cooker is a disk 25.0 cm in diameter, what force must it be able to withstand at this pressure? (a) How many moles per cubic meter of an ideal gas are there at a pressure of and at (b) What is unreasonable about this result? (c) Which premise or assumption is responsible? (a) An automobile mechanic claims that an aluminum rod fits loosely into its hole on an aluminum engine block because the engine is hot and the rod is cold. If the hole is 10.0% bigger in diameter than the rod, at what temperature will the rod be the same size as the hole? (b) What is unreasonable about this temperature? (c) Which premise is responsible? The temperature inside a supernova explosion is said to be (a) What would the average velocity of hydrogen atoms be? (b) What is unreasonable about this velocity? (c) Which premise or assumption is responsible? Suppose the relative humidity is 80% on a day when the temperature is (a) What will the relative humidity be if the air cools to and the vapor density remains constant? (b) What is unreasonable about this result? (c) Which premise is responsible? 1: Decreased the atmospheric pressure results in decreased partial pressure of water, hence a lower humidity. So evaporation of water from food, for example, will be enhanced. The molecules of water most likely to break away from the food will be those with the greatest velocities. Those remaining thus have a lower average velocity and a lower temperature. This can (and does) result in the freezing and drying of the food; hence the process is aptly named freeze drying. (b) the two values are nearly identical. The buoyant force supports nearly the exact same amount of force on the copper block in both circumstances. (c) At high pressures such as these, the ideal gas law can no longer be applied. As a result, unreasonable answers come up when it is used. (b) The velocity is too high—it’s greater than the speed of light. (c) The assumption that hydrogen inside a supernova behaves as an idea gas is responsible, because of the great temperature and density in the core of a star. Furthermore, when a velocity greater than the speed of light is obtained, classical physics must be replaced by relativity, a subject not yet covered. 13.6 Humidity, Evaporation, and Boiling by OpenStax is licensed under a Creative Commons Attribution 4.0 International License, except where otherwise noted.